"A quick meal in between classes or a study break." Cook macaroni and cheese in a saucepan on the stovetop according to package directions. Once macaroni and cheese is done, stir in chili, and cook over medium heat until hot, about 2 minutes. Sprinkle with shredded cheese to serve. This is unexpectedly good! I now keep the ingredients on hand for "emergency meals." 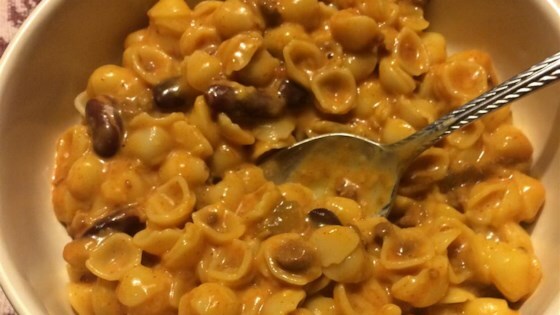 i made this with campbell chunky firehouse chili and kraft mac and cheese. an amazingly delicious and quick meal, will definitely make again! thanks! This is a great meal when you want something quick, easy, and inexpensive. I use Hormel vegetarian chili.